Home » Blog » Are Not-For-Profit Credit Counselling Agencies Now Just Debt Collectors? A debt collector does just what the name suggests: they collect on unpaid debt. They won’t review all your debt relief options with you or give you a plan that makes debt repayment realistic and affordable. Their only goal is to recover as much debt for the creditor as possible. That’s how their business makes money. You might be shocked to learn that some big not-for-profit credit counselling agencies are now operating the same way. In fact, they are registered with the Ontario government as debt collection agencies. Credit counselling agencies have changed. Many are no longer registered charities. Some credit counselling agencies don’t do a lot of budgeting or actual in person counselling anymore either. Credit counselling organizations in Canada today are often big, national call centers. Now when you call a credit counselling call centre, you may be sold a debt management plan (DMP), where you repay 100% of the debts you owe, but with a lowered interest rate. We take a deep look at why not-for-profit credit counselling agencies have become nothing more than debt collectors. We also examine the implications for you as a debtor in need of help. But it’s not all bad news: we believe that not-for-profit credit counsellors can serve a very important role in educating and helping Canadians manage their money. Not-for-profit credit counselling agencies used to be small, local organizations with trained staff that provided money management and budgeting advice in their communities. While they had the ability to provide a debt management program to their clients, local credit counsellors were also experts who could deal with the causes of financial problems like addiction and mental health issues. These local counsellors would also take the time to review your financial situation in full, only suggesting a debt management plan if it fit your needs. If you file a bankruptcy or consumer proposal, there are two credit counselling sessions included as part of the process, to help you get a fresh start. For twenty years, Hoyes Michalos referred many of our clients to local not-for-profit credit counselling agencies to receive these counselling sessions, and often to also avail themselves of other counselling to help them solve their underlying issues (such as with marriage counselling, addiction counselling, and so on). In 2018 the federal government made changes to the rules, making it virtually impossible for a trustee to refer a proposal or bankruptcy client to a not-for-profit credit counsellor for the required BIA counselling sessions. Sadly, with the rise of for-profit debt consultants, the government became concerned that credit counselling was becoming a revenue source for debt consultants, so to prevent outside individuals from being involved in the bankruptcy process, the Government of Canada effectively restricted Licensed Insolvency Trustees from partnering with or providing any funding to third-parties. This included local credit counsellors. Hoyes Michalos used to send our clients to local agencies to complete mandatory credit counselling sessions as part of a bankruptcy or consumer proposal discharge. We liked to do this because, in addition to budgeting help, local credit counselling companies offered a broad array of supporting services that could help our clients. But this new restriction to counsellors resulted in a significant loss of funding for them. Many of these local counsellors went out of business as a result. For the record, Hoyes Michalos now has 17 licensed insolvency counsellors on staff, in addition to our Licensed Insolvency Trustees. As the local agencies closed, the only remaining players to offer credit counselling in many areas of Ontario were three large non-profit organizations. Their main source of funding are debt management plans, sponsored by banks and other lenders. They rarely provided actual in person credit counselling. The problem, however, is these large agencies continue to label themselves as “non-profit credit counsellors.” Until recently, many operated as a charity (and some still do), even though there is no offer of real counselling or charitable work in the community. The labels, however, make these agencies appear wholesome and helpful to the unsuspecting consumer, when in fact their primary source of revenue is collecting debts for big banks. Current not-for-profit credit counselling agencies are funded almost exclusively by lenders. When you make payments in a debt management plan, the credit counselling agency sends the funds to your creditors, who then send back a return payment to the counsellor. (It’s called a “fair share contribution”, but in essence it’s simply a payment from the banks to fund the operations of the credit counsellors). The more money a counsellor can send, the higher the payment in return. This is how a debt collector makes money too. For further proof, take a look at the supporters for Credit Canada, one of these large agencies, under “Sponsorships & Special Projects.” Their primary supporters are banks and lenders. They are registered as collection agencies. In order for these credit counselling agencies to be allowed to administer debt management programs, they must be registered as a collection agency by the Ontario Ministry of Government in Consumer Services. Why? Because they are effectively collecting debts on behalf of creditors. You can search here for the name of any non-profit credit counselling company to verify their registration as collection agents. This will give you more insight into their intentions and services. They provide a one-way service, as opposed to a two-way conversation. Non-profit credit counsellors are now primarily interested in having you sign up for a debt management program to repay as much of your loans in full as possible. Like debt collectors, they do not give you all of your debt relief options so you can make an informed choice. They’re not really “credit counsellors.” As mentioned, credit counselling agencies no longer exist to do any real counselling for their clients. These large agencies are essentially a call centre that will ask you to list your debts, and then they will come up with a repayment plan where you pay back your loans in full with a slightly reduced interest rate. They are hardly “non-profits.” A non-profit means that as a company, you are not trying to make a profit. However, financial statements from one of the biggest agencies – Credit Counselling Society of British Columbia – which is still registered as a charity, reported a total revenue in 2017 from the sale of goods and services at over $13.5 million. To be clear, that revenue is from collecting money via debt management plans in both fees from the plan and kickbacks from banks and lenders. They issued tax receipts for for just $71,000 in donations and earned investment income of $228,000. It’s also important to note that two other large agencies recently had their charitable statuses annulled. Credit Counselling Services of Atlantic Canada and Credit Canada Debt Solutions can no longer operate as charities since Canada Revenue Agency (CRA) deemed to have granted that status in error, even though the agencies held it many years before annulment. CRA views them as a business, not a charity. By calling themselves charities or non-profits, credit counselling agencies appear to be on your side, when really their primary obligation is to the banks who pay them. An even bigger risk to you is that by using their services, you may be heading down the least efficient path for dealing with your debt problems. A debt management program isn’t legally binding on all your creditors. CRA does not participate in a DMP, and some payday loan companies don’t either. So, while you may get a plan for some of your debts, you’ll have to deal with your creditors outside of a DMP too. You’re repaying the entire debt balance. Ultimately, a debt management plan isn’t providing real relief from your debt. While you may get a reduced interest rate, you’re still going to be making large, unaffordable monthly payments to pay down your loans in full. You don’t receive legal protection against creditors. If you’ve been behind on your debt payments and are now facing legal repercussions, know that a DMP won’t protect you against them. This means you could still get a wage garnishment, face a lawsuit or get harassing phone calls from creditors while in a DMP. As mentioned, the plan is in no way legally binding. A DMP has the exact same credit rating impact as a consumer proposal. In an effort to get you to sign up for a DMP, these agencies will tell you to avoid seeing a Licensed Insolvency Trustee because a bankruptcy or proposal will ruin your credit rating. You might be surprised to learn that a consumer proposal has the exact same credit rating impact on your bureau as a DMP (an R7). But the difference is with a consumer proposal is your monthly payments are much smaller because you’re repaying only a portion of what you owe, while getting legal protection. You can also eliminate all unsecured debts in a proposal, including payday loans and CRA tax debts. The best part is, you get to achieve debt relief more quickly and then be on a path to rebuilding your finances. Is it always wrong to get a debt management plan? Not necessarily. If you only have a couple of small loans and you know you can manage the payments, but would like interest relief, then a debt management plan could be the right option for you. You would still need to ensure that all creditors are onboard and that the interest relief is worthwhile before signing up. Unlike unregulated credit counsellors, a Licensed Insolvency Trustee, by law, has to explain all of your debt relief options to you before you make any decision. We can never force you into a bankruptcy or consumer proposal. What’s more, we are not paid by creditors to carry out either debt relief option. As officers of the court, we act as a referee between you and your creditors, with an equal obligation to both sides. Our fees are regulated by the Government of Canada and no creditor can give us incentives or kickbacks for carrying out our duties. Is there a role for not-for-profit credit counsellors? Yes. For 20 years we were happy to send clients to local not-for-profit credit counsellors for advice on budgeting, spending, saving and money management. Many people get into debt trouble when their marriage breaks down, or they have to deal with drug or gambling addictions, so in the past we were always happy to refer clients for specialized counselling to help them get a fresh start. With the new rules, that is much more difficult to do. The problem, obviously, is that a not-for-profit counselling agency needs to pay the bills. They have staff salaries and rent to pay, and with many other worthy charities vying for the public’s charitable donation dollars, it’s difficult for them to raise money in donations. Their only option is to go where the money is: the big banks and credit card companies, and get sponsorship dollars and debt management plan fees to fund their operations. That’s perfectly understandable, but is it in consumer’s best interests to be getting debt advice from an agency that is funded by lenders? What’s needed is a different funding model. Currently in every bankruptcy and consumer proposal filing we pay a filing fee to the Office of the Superintendent of Bankruptcy ($75 for every first time bankruptcy, $100 for every consumer proposal we file). What if that filing fee was increased by $10, or $20, and that money was used to create a fund to provide funding for not-for-profit, charitable, local, credit counselling organizations to provide budgeting and other money management advice? What if the big creditors also contributed to this fund? With a centrally administered fund there would be no direct influence, so the credit counsellors could focus on providing advice for the benefit of consumers, not the lenders. That may not be the solution, but at least it’s a proposal to start the conversation. 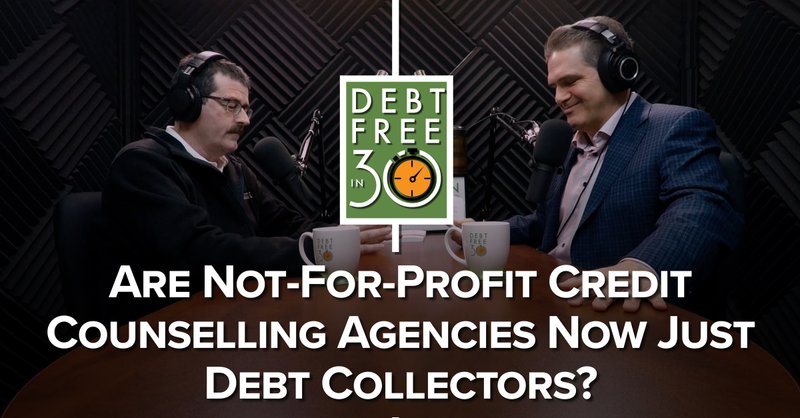 For more detailed information on issues surrounding not-for-profit credit counsellors and their similarities to debt collectors, tune in to today’s podcast with guest Ted Michalos. FULL TRANSCRIPT – Show 232 Are Not-For-Profit Credit Counselling Agencies Now Just Debt Collectors? Doug Hoyes: We haven’t had a show yet this year where we’ve gotten ourselves into a lot of trouble with our theoretical opinions, so today Ted Michalos and I will make everyone mad by answering a seemingly click-baity question. Are credit counselling agencies really nothing more than debt collectors? Let’s start by talking about what debt collectors do. A debt collector obviously is someone who collects debts. I can think of two obvious attributes of a debt collector. First, they work for the creditor, they don’t work for you. A debt collector works for the company that is owed the money. So if ABC Bank loans John some money and John doesn’t pay, ABC Bank can hire a collection agency to collect that debt. Obviously the collection agency is a debt collector because they are hired by the bank to collect the debt. The debt collector doesn’t work for you, they work for the bank. They provide a service to the bank and in return the bank pays the debt collector. The second attribute of a debt collector is that they want to collect as much money as they can from you. That’s pretty simple, right? A debt collector wants to collect the maximum amount of money from you. That’s what they’re hired to do. The bank wants to recover as much of their loan as possible regardless of what you can afford. And the more the collection agent recovers on behalf of the bank the more they get paid since most debt collectors are paid by commission. So how does all this apply to credit counsellors? And, to be fair, what about licensed insolvency trustees? Here’s my take on this. Debt collectors, credit counsellors and licensed insolvency trustees fulfil different roles in the debt recovery business. However, when you look at the outcomes, credit counsellors act more like debt collectors than debt relief experts. That’s what we’re going to explore today. To explain it, let’s have Ted Michalos join the conversation. Ted, you’ve sat patiently while I went through that introduction. Ted Michalos: Quietly, I’ll add. Doug Hoyes: And quietly. Very good. So let’s start with the basics. What does a not‑for-profit credit counsellor do? Ted Michalos: Their first responsibility is really educating the public. So they give budgeting advice, spending patterns, how to improve the way you’re using your money and they also do something called a debt management program. Ted Michalos: A debt management program is a voluntary process whereby your debts, not all of them, but some of your unsecured debts are pooled together, so you make a single monthly payment to the not-for-profit who then makes payments to your creditors. An example might be you owe a couple of credit cards and maybe an old phone bill, $10,000. Instead of trying to make three payments every month you only make one payment to the not-for-profit. Doug Hoyes: And we don’t do debt management plans. Ted Michalos: We cannot. It’s a conflict of interest, even if we could, because of the nature of our licences. So a debt management plan, you’re going to repay 100% of the debt, probably you’re going to get relief from the interest and you’re going to do it over preferably four years maximum, although they can stretch into five. Doug Hoyes: Maybe you’re paying back a third or some lesser number. Ted Michalos: In almost all consumer proposals you’re paying back less than 100% of what you owe. Because a proposal is an alternative to bankruptcy. It’s not an alternative to a debt management plan. So the debt management plan, the assumption is you can afford to repay 100% of your debt. Whether or not that’s the right financial answer is a different conversation. Doug Hoyes: And we can get into that. So the obvious difference is, in a consumer proposal you’re not paying back 100 cents on the dollar and in a debt management plan you are. Ted Michalos: Correct. That’s a simple . . .
Doug Hoyes: So what are the other big differences between a consumer proposal and a debt management plan? Ted Michalos: The biggest single one is a consumer proposal is a legally binding process. You are taking advantage of the law, so it provides you a level of legal protection. By that we mean when you file a proposal there’s an automatic stay of proceedings, people can’t continue with any legal actions they’ve started against you. So they can’t take you to Small Claims Court or Superior Court, they can’t garnishee your wages. If they’re already started garnisheeing your wages, a consumer proposal will stop them. So a debt management plan isn’t the legal procedure, it doesn’t have any of those features. Doug Hoyes: It’s a voluntary procedure, in effect. Ted Michalos: Well, and there’s certain types of creditors that have publically said they’re opting out. Like payday loan companies want nothing to do with debt management programs. Revenue Canada generally is not involved in a debt management program, but they are by law included in a consumer proposal. Doug Hoyes: And that’s a big difference. Okay, so, with that background, let’s get to today’s question. Are credit counselling agencies nothing more than debt collectors? I want you to answer this question by giving both sides of it. Doug Hoyes: So let’s have you start by telling me why credit counselling agencies are not debt collectors? Ted Michalos: Alright. We started by saying that one of their main functions is to educate the public, to teach people about budgeting. Well, I’ve never heard of a collection agency offering to help someone with their budget on the phone, except to say that “you need to find $200 a week to pay me.” I mean that’s the extent of it. Similarly, credit counsellors generally will talk about spending habits, how to improve where your money goes every month. I’ve never heard of a collection agency offering to do that either. In the area that they get into difficulty is that one of their primary sources of funding traditionally always was these debt management programs and that really is – Well, so I’m not answering your question anymore, this is the way that they’re like collection agencies. Doug Hoyes: Okay. And we’ll get to that. So we’ve dealt with not-for-profit credit counsellors for years and years and years. Ted Michalos: Yeah. Can’t find any anymore, but sure. Ted Michalos: Well, the government, bless their hearts. That’s what I was told that the people in the south say when they want to call somebody an idiot. But they revised the laws effectively last year whereby credit counselling, not-for-profit credit counselling agencies can’t provide some of the services that they used to provide. Or at least they can’t do it easily. One of their sources of funding was always doing insolvency counselling for licensed insolvency trustees and whenever you file a bankruptcy or consumer proposal you’re required to attend at least two credit counselling sessions so that we can try to re-educate you and prove your financial management. Firms like ourselves, we used to subcontract all of that work, because in our opinion the credit counsellors were better suited towards providing that type of service. It’s the kind of education that they wanted. It’s not that we couldn’t do it, we thought there was value added in funding these not-for-profits to provide this service to people. Doug Hoyes: And if someone comes in to see us and they’ve got debt problems, those debt problems may be caused by other things. It could be an addiction issue, it could be gambling, it could be marriage problems. Ted Michalos: Yeah. That’s the way we always used to think about it. So they changed the laws last year, the government’s been trying to reduce the involvement of debt consultants in the insolvency process. Now a debt consultant is somebody that basically charges you a fee and says “Yeah, you just file a consumer proposal with a trustee.” And many of the debt consultants are disguising themselves as credit counsellors. The issue being that nobody owns that term ‘credit counsellor’. So the government didn’t licence credit counsellors, they had no control over who called themselves one. So the government’s objective, at least I think this was their objective, to reduce the impact of debt consultants, they took a major swing at credit counsellors. And the not-for-profits, well, the vast majority of them no longer provide any credit counselling services, because the funding model’s dried up. Doug Hoyes: Yeah. I want to talk about that funding model and we’ll get to that. I think you and I would both agree that over the last 30 years that we’ve been doing this kind of work we’ve seen a huge change in the credit counselling world, the local agencies, where you used to be able to go in, sit down, face-to-face like we’re doing here and have someone walk you through budgeting, looking at your numbers, you know, it’s just not a thing anymore. Now, you alluded to the government changes up until October 1st 2018, if we had a bankruptcy or consumer proposal client who wanted some detailed budgeting advice or, like I said, needed some specialized counselling, we wouldn’t hesitate to send them for their credit counselling sessions to a full service not-for-profit agency. Now the rules are so cumbersome that it’s very difficult for us to send them outside. I’m not going to go into the changes to the rules, suffice to say it’s much more cumbersome for us to do that. Now, in some ways that’s good for our clients because they stay in-house, we can help them all the way through. Doug Hoyes: And we now have, I think, something like 17 licensed BIA Bankruptcy and Insolvency Act insolvency counsellors on staff, in addition to all of our LITs who are also fully accredited. So that’s over 35 people in-house who can do credit counselling. So, in most cases that’s great for our clients, but, like you said, there are cases where it would be good for our clients if we could easily get them additional help and that’s very difficult with the current rules. But, I’m digressing. Doug Hoyes: So, let’s get back to the topic. So you’ve explained why traditionally credit counselling agencies were not debt collectors. Give us the other side of the story, why do many people now consider credit counsellors to really be debt collectors. Doug Hoyes: A fair share voluntary contribution. Ted Michalos: Right. So they make a payment back to the agency. I’ve got no problem being paid to do their work, but now the only thing they’re getting paid for is to collect on debts. One of the definitions of a collection agency is they get paid for collecting on the debts. Doug Hoyes: Well, and they have to be registered with the Ontario government as a collection agency. Ted Michalos: Well, that’s the kicker on this. Because now all of these national agencies are licensed as collection agencies, even though they’re credit counselling agencies, so the line has completely disappeared. Doug Hoyes: For any of our listeners who want to fact-check us, I’ll put a link in the show notes to the Ontario Ministry of Government in Consumer Services and you can go there and you can type in the name of any not-for-profit credit counselling agency and you can see whether or not they are registered as a collection agency. So, why do you think it is that credit counsellors are required to register as collection agents? Ted Michalos: Because, effectively, they are collecting on behalf of a creditor. The reason that they government created the registration system in the first place was so there’s some sort of accountability, there are regulations in place, there are rules because, quite frankly, a lot of collection agencies have pretty poor reputations for some of the tricks and techniques that they use. They used to send out documents that look so much like they’d already been to court to scare people, that actually the lawyers had to step in and ban that practice, the lawyers that were associated with it. It’s just so easy to manipulate people on the phone or by text or over the internet, to scare them into doing things that they shouldn’t, that licensing is required and regulations are required. Now those same regulations apply to these national credit counselling agencies, because effectively they’re collecting for creditors. Now, given the choice with somebody dealing with a not-for-profit credit counselling agency as a collection agency versus some of these people I was just describing, you’d much rather deal with the not-for-profits, but they don’t get your account. I mean, they don’t buy accounts from the creditors. You go to them asking for help and effectively it’s kind of a reverse collection agency. You’re voluntarily saying “I need help paying these things” and so you hire them to do it as opposed to the collection agency hiring them, but it’s still the creditors that are paying them. Doug Hoyes: Yeah. And it’s the Ontario Collection and Debt Settlement Services Act, which is where this is defined, I mean it defines a collection agency as anyone who obtains or arranges for payment of money owing to another person. So, you’re right, if a credit counsellor arranges for you to make payments through a debt management plan, to your creditors they’re acting as a collection agency. Ted Michalos: Now, you’d think then that that would apply to us. Because effectively we are collecting money to repay debts. Of course, we’ll only be paying a portion of the debt or none at all, depending on the situation. But there’s a specific prohibition in the law excluding licensed insolvency trustees. Doug Hoyes: Section 2, Sub 1, Sub C. You’re exactly right. And it says that the act does not apply to a trustee licensed under the Bankruptcy and Insolvency Act. It’s a law. So why do you think then that the government, when they drafted this law, specifically said that a credit counsellor is a collection agency, but a licensed insolvency trustee is specifically not a collection agent? Ted Michalos: I’m not going to try and second-guess politicians, because I don’t know that I can dumb myself down that much. But, effectively, let’s look at who’s initiating the contact, who’s paying who for what service. Doug Hoyes: Follow the money. Ted Michalos: Always follow the money. So in a debt management program the not-for-profit agency sets up the program, holds the funds for you and advances it to the creditors, the creditors then make a return payment to them. That’s how the money actually flows. It goes from you to the not-for-profit to the creditor, the people that you owe, back to the not-for-profit. So it’s a pretty clear stream where the money goes. With a licensed insolvency trustee the money is held in trust, a fee is deducted before any monies are released to the creditors. But the trustee’s obligation is to the entire community. So we have an equal obligation to you, the person in debt, as we do to the creditors that are owed the money. The best way to think of an LIT in my opinion is that we’re referees. We’re there to design and monitor and control the legal remedies for people to get relief from debt. Whereas the debt management program and a credit counsellor doesn’t have that – it’s not the same relationship at all. Doug Hoyes: Yeah, and I guess that goes back to the first attribute of a debt collector. They work for the creditor, not you. Doug Hoyes: “And you end up sending money to the same creditors or sending to the same banks and whatnot, credit card companies.” So doesn’t that also make us a collection agent then? Ted Michalos: Again, the difference, and maybe you’re thinking this is just semantics is the actual flow of the money. So we don’t have any kind of relationship with any of the lenders, any of the credit granters. You come to us, we contact your creditors and we say Jane Doe is going to offer to repay a portion of their debts.” And they do that by making payments to us which we hold in trust and then we deduct a fee before those funds are released to whatever creditors the person owes money to. Doug Hoyes: So the banks, unlike with the credit counsellor, are not sending us money. Doug Hoyes: We’re sending money to them. So explain in simple terms how do we get paid then. Ted Michalos: Let’s talk about a proposal first, because that’s what we’re comparing to the debt management program. In the law it simply says there’s an administrative fee of 20 cents on the dollar for any money to be sent to creditors. So, we are getting paid by whomever is making the payments into the proposal. So, if I make $100 payment and I was going to send that $100 to your creditors, well, the $20 will get paid to me for doing that first. There’s no contractual relationship between trustees and the creditors. Now, there is a contractual relationship between the not-for-profits. I mean they signed that fair share contribution agreement with the – I think it’s the Canadian Banking Association. Doug Hoyes: Yeah, I think they now do it on an individual basis. Each one negotiates their individual one. Doug Hoyes: But, you’re right, our relationship is federal law. There’s this federal law that says if a consumer proposal is accepted then we get this percentage. And, you’re right, it’s a percentage of what’s in the pot. So if we’ve got a dollar, some of it goes to us, some of it goes to the government, because they’re regulating this process and obviously the rest goes to the creditors. Doug Hoyes: Yeah. And a third is a ballpark number. There are lots of proposals we do that are 15 cents on the dollar, there are lots that we do that are more than that. Doug Hoyes: But, you’re right, it’s not just a blanket you’re paying everything back. It’s not as simple as that. So, okay, we get a percentage of what our client pays and the rest – the government gets some, the rest goes to the creditors. We send money to them, they don’t send it to us. So it’s pretty obvious, I think, we’re not working for the creditors. Doug Hoyes: I want to go back to something you had said earlier. When all of these not-for-profit agencies started they were not-for-profit agencies and technically they still are and that’s the difference between us and them. We are not not-for-profit. Doug Hoyes: We are a business. Ted Michalos: We are a for profit corporation. If we don’t provide value to our clientele then they’ll look for future services someplace else. Doug Hoyes: Okay, so we are not not-for-profit, we are also not a charity. Doug Hoyes: And there’s a difference between those two words. This is something that kind of grates on me a little bit, because you can be a not-for-profit organization and not be a charity. Not-for-profit just means that you are not trying to make a profit. Ted Michalos: You know what you could put in the program notes, we had a couple of these large national credit counselling agencies lost their charitable status. Doug Hoyes: Well, let’s talk about that, because you’re right. So a charity is an organization that is engaged in charitable works. I actually looked it up on the Canada Revenue Agency website, because they regulate this and I’ll put the link in the show notes. They say that registered charities are charitable organizations that must use their resources for charitable activities and have charitable purposes that fall into one or more of the following categories. The relief of poverty, the advancement of education, the advancement of religion, other purposes that benefit the community. So a charity is doing something good for society as a whole. Ted Michalos: The kid’s soccer league. Doug Hoyes: The kid’s soccer league, exactly right. A sports organization, something like that. Now, in the past not-for-profit credit counselling agencies as you alluded to were also registered charities because they were doing education and helping people with their money and their debt, which, of, course benefits the community and oh, fewer people under stress, that sort of thing. But, today, most of the big credit counselling agencies are not registered charities. For example, Credit Counselling Services of Atlantic Canada is a large not-for-profit credit counsellor, obviously in the Maritimes, and they became a charity in 1993, but their charitable status was annulled in 2013. Again, let me be clear, I’m going to quote from Revenue Canada CRA’s website, “When a charity’s registration is annulled, it is deemed to have never been registered.” Annulments generally occur when registration was granted in error, an organization whose registration had has been annulled can no longer issue donation receipts for income tax purposes and is no longer eligible to receive gifts from registered charities.” So that means that the organization was not doing charitable works. That makes sense, because if what you really are is a collection agency, that’s a business and you’re getting paid for doing that business, so obviously you’re not a charity. Doug Hoyes: Another big credit counselling agency is Credit Canada Debt Solutions. They were registered as a charity in 1967 and their charitable status was annulled on September 27th 2018. That is amazing to me. They were registered as a charity for over 50 years and then someone realized the registration was an error and it was annulled. I mean something kind of strange is going on here. Ted Michalos: But if you look at the financials for each of those organizations it becomes immediately obvious that they’re not charitable organization. I’m not saying that they’re for profit, actually I will say that they’re for profit, but they don’t satisfy the criteria. The vast majority of their revenues and the vast majority of their operating expenses were going towards the management of these debt management programs. It wasn’t to providing educational services or community support of any of those other charitable activities. Ted Michalos: It’s public information. Doug Hoyes: It’s public information. You can pull them off Revenue Canada’s website. In 2017 they issued tax receipts for $71,000 in donations, they earned investment income of $228,000 and their total revenue from the sale of goods and services was over $13.5 million. That sounds like a business to me, not a charity. Let me be very clear. They earned 13 and a half million dollars largely collecting money on behalf of banks and lenders. Now, before we get all high and mighty, probably too late, I think I’ve been high and mighty now for the last five minutes here, but are we overstating this, are we making a mountain out of a molehill. Hoyes Michalos & Associates is a business. We help people deal with their debts. Doug Hoyes: The big credit counselling agencies or businesses, they help people deal with their debts. So what’s the big deal here? Ted Michalos: Fundamentally, the question is are you going to be more inclined to deal with a not-for-profit or a charitable institution to deal with your situation than you are a for profit corporation. I think there’s a bias in the language that you assume that, well, it’s a not-for-profit, it’s a charity. They’re not there to try to make a buck. Their only real impetus is to try and help me. The issue is, of course, that I’m not sure that’s an honest representation of what they do. If you had $71,000 worth of charitable donations and $13.5 million dollars worth of revenue from banks, I’m pretty sure they’re working for the banks. Ted Michalos: Yeah, we pretty much have. Doug Hoyes: Last 10 minutes. But we’re here to give practical advice. And you’ve already alluded to this, there is a bias that oh, you’re a not-for-profit, you’re a charity. I want to go talk to you, I don’t want to go talk big, bad Ted Michalos who’s in this to make money. Doug Hoyes: If you have debt, how do you decide if you should call a not-for-profit credit counsellor or a licensed insolvency trustee? I mean if we all make money for helping you with your debts, is there really any practical difference? Ted Michalos: Maybe at the end of the day there isn’t. I mean a licensed insolvency trustee has a fiduciary responsibility to explain to you all of your different options. That’s going to include talking about debt management programs. So if you’re an individual that can afford to repay 100% of your debt, well, then maybe the debt management program is the right solution for you. It’s going to have the same hit on your credit report as a consumer proposal and a consumer proposal you’re likely going to pay less than 100 cents on the dollar, but there are times when it was the right solution. Now, I have to be honest, I don’t recommend it much anymore, because all the local agencies are gone. Doug Hoyes: But let’s talk about that then. So there are times when a debt management plan is the right solution. Doug Hoyes: So give me some examples then. It’s not obviously a bad idea all the time, there are cases where a debt management plan might actually be the correct answer. Ted Michalos: I always thought when the local offices were in place the debt management program was the correct solution, if you had a limited amount of debt. So maybe you owed a couple of credit cards and a utility, maybe an old landlord that the local agency knows is receptive to these kind of deals. Because you can’t force people into one of these programs. So let’s say you owed maybe $10,000 or $12,000, you need time to get back over a hump, because something bad happened. You’re off work for a couple of weeks, you got sick. It really doesn’t matter what the reason is. $12,000 over four years you’re looking at $250 a month. It’s a number that’s manageable. You get into the 30, 40, 50, 60 thousand dollars and you’re trying to do a debt management program, suddenly they don’t make as much sense. If you’re paying back 100 cents on the dollar on $50,000, your monthly payment over four years is 1,000 bucks. It’s not manageable for most people anymore. Doug Hoyes: So a debt management plan would make sense if your debts are moderate. Yeah, okay, I could get them paid off in a couple of years. I need a break on the interest. And obviously it has to be with favourable creditors. Doug Hoyes: So like you said, the local agency knows the local hydro company, the local, you know, whatever. They can work something out. Ted Michalos: And, automatically, payday loans will refuse to participate and automatically the government’s not going to participate. Although there were debt management programs focused on student loans. Maybe that’s a different program when we talk about student loans again. Doug Hoyes: But, again, if it’s a government guaranteed student loan, then the government has to be agreeable to it. Ted Michalos: Right. Now I think those debt management programs are gone, by the way. Because they were provided by the local offices and I just don’t think – I mean, the local offices are gone. Doug Hoyes: Yeah, this is the problem. We used to send people to – well, Guelph would be a classic example. Doug Hoyes: And you’ve been in Guelph for decades and decades. And they just don’t exist anymore. There is no one there to send someone to. Doug Hoyes: To sit down, work out a budget, work out a debt management plan, whatever it is. Now you alluded to a couple of reasons why someone would want to go to a not-for-profit agency. One is they’re not-for-profit, they’re a charity, so obviously they’re pure. Doug Hoyes: You’re saying no. Ted Michalos: No. A very quick credit report lesson, folks, is the rating from 1 to 6 are your payment frequency on your debts. So if you make regular payments every month it shows as a 1, two months it’s 2s, 6 is used if you haven’t paid in five months. Seven is used when you’ve entered into some sort of settlement on your debt. And there only really are two types. It’s a consumer proposal or a debt management program. So regardless of whether or not you’re paying 100 cents back on the dollar on the debt management program or 30 cents on the dollar in a consumer proposal, it shows the same on your credit bureau report. Doug Hoyes: Yeah, there’s no big advantage to going the other route. Ted Michalos: No. Again, this is another program, but don’t ever make your debt relief decision solely on what happens on your credit report. Because people are so confused and misunderstand how credit reports work that it’s just a bad basis for a decision. Doug Hoyes: Yeah. A better basis is if I do a debt management plan I’m going to have to pay $1,100 a month and the example you gave and in a consumer proposal maybe I’m paying 300. Ted Michalos: Yeah, that’s a perfect example. Doug Hoyes: So, okay, that’s not a hard decision to make, particularly when they’re both going to show up essentially the same on my credit report. Doug Hoyes: Because I can’t afford it. Ted Michalos: And in six months you’re going to file the consumer proposal anyway. Doug Hoyes: So a consumer proposal is a better option than when your debts are large. Ted Michalos: Your debts are large. If you got government debts, payday loans. If your situation is complicated. And by that I mean if you got more than three or four creditors. Because the more creditors you have, the more difficult it is to get any kind of debt management program agreed to. I mean it’s a voluntary program, you’re paying back 100 cents on the dollar, but you can’t compel people to. Doug Hoyes: Yeah, and if you have 10 different creditors and they can make a deal with eight of them, that still leaves two who are yelling and screaming and threatening to take you to court. In a consumer proposal, if the majority of the dollar value agrees, everyone else has to take the deal, so it’s a lot easier to make it compelling. Doug Hoyes: So, because as debt management plan requires the debtor to pay back 100% of their debt it’s often not the best outcome for the debtor and, again, we talked about debt collectors wanting to collect as much as they can from you. That’s what a debt management plan does. And, of course, that’s not the objective as you’ve explained in a consumer proposal. Our goal is let’s get a reasonable number. Now a lot of people say “Well, yeah, but you trustees, you already explained that you get a percentage of what’s in the pot. So you’d much rather the person pay $1000 a month than 500.” And I say no, I would much rather you pay what a reasonable number is, that we can get the creditors to agree to. Because if I force you into some $1000 a month plan that you can’t afford, it’s just going to crash anyways and you’re not going to be able to pay it. So that makes no sense either. So, again, we explain your options and hope we come up with the correct option for you. So what is the difference then, we’ve talked about the difference between debt management plans and consumer proposals, what’s the difference between a licensed insolvency trustee and a credit counsellor. Ted Michalos: So the most obvious difference to me is there’s no such thing as a licensed credit counsellor. So anyone who wants to can call themselves a credit counsellor. Nobody owns that term and I think that’s the mistake the government made 30, 40 years ago, that allowed the debt consultants to migrate away from that term, debt’s bad, to credit counselling sounds good. Biggest single difference is the vast majority of licensed insolvency trustees are also chartered professional accountants. That’s not to say that those that aren’t chartered professionals accountants are any lesser or different. But we are professionally trained to deal with finance, accounting, debts, debt relief, debt restructuring. It’s what we do. It’s why we’re paid the big money. You can look to see what my credentials are, you can check to see that my licence is still valid, that I’m not in some sort of abeyance or under some sort of restrictions. That would be a pretty rare thing, but there’s nowhere to check if a credit counsellor is actually legitimate or not. Doug Hoyes: Yeah, you can go on to the Office of the Superintendant of Bankruptcy’s website, do a search for a licensed insolvency trustee, punch in Hoyes Michalos, punch in Hoyes, Michalos, whatever and you will see that we exist there. Ted Michalos: Yeah. And about half the people we talk to don’t require our services. We’re able to assist them by either pointing them in the right direction, maybe sending them off to refinance their home or they just needed some budgeting advice. You’re not going to find a credit counsellor that turns away half the people who call them. Because you call them, because you got a debt problem, they’re going to put you in a solution. Doug Hoyes: They want to help you. And your point about the word credit is right and I was thinking “Yeah, didn’t I talk about that in my book?” Yeah, I did. Ted Michalos: There you go. Doug Hoyes: I had to get the book in here somewhere. Myth number 4, give credit where credit is due. And basically I made the point that you just made, that credit is a positive term. Doug Hoyes: So I don’t want to be called a debt counsellor, I want to be called a credit counsellor, because that’s a more positive thing. So, okay, let’s cut to the chase here. You and I have worked with not-for-profit credit counsellors for over 20 years. Doug Hoyes: They, I think we both agree, can be great money educators, they can be great at helping people with budgeting and other money management issues. I object to them suggesting debt management plans when a consumer proposal or some other option would be better for their clients. That’s what you just said as well. Doug Hoyes: And I definitely object to them hiding behind the words not-for-profit and charity when really what they are is a business, because I think people go to a not-for-profit counsellor instead of an LIT for the reasons you just said, it sounds more pure. I think if credit counsellors were honest and told their clients upfront that most of their funding comes from the big banks, people would perhaps think twice about using them. Again, the point that you just made. Now, I get it. They need to pay their staff, they need to keep the lights on, they need some money coming in. People in debt don’t have money to be paying for advice. Doug Hoyes: So credit counsellors can’t charge them a fee for advice. They’re aren’t like, you know, fee-only certified financial planners who charge you by the hour and, you know, aren’t selling you anything, so you’re getting relatively unbiased advice. A credit counsellor only has two obvious ways to generate funds. They either do debt management plans and get the contribution back from the bank or they take sponsorship money directly from the banks. Doug Hoyes: Because that’s where the money is, but obviously that’s the problem. Not-for-profit credit counsellors have a funding problem. Doug Hoyes: This is the big issue. I believe that the vast majority of them are very good people, they really want to help people, they want to do good, but they also need to have money to do these good works. Doug Hoyes: So what is the solution? How can credit counsellors help people without appearing to be on the payroll of the big banks, which, in my mind is a conflict of interest. Ted Michalos: I think that the – I mean, the government really screwed up when they made the changes last year. Because they took out one of the legs of the stool, one of the funding models that credit counsellors had, in that we would pay them to provide insolvency counselling to all of our clients. Now we’re not even allowed to make donations to them or contributions to have a trade show or something now, because it looks like we’re trying to curry favour or buy bias from them or something. Until they can settle on a model where they’re paid for their services to give unbiased financial planning education, I don’t know that there is a funding model for them anymore. Doug Hoyes: And that’s kind of the difficulty. Ted Michalos: Right. And our communities are much worse off. I mean we went to providing our own service because we had to. We honestly believe that the communities were better served by the not-for-profits giving this advice, because they could always talk about substance problems or gambling problems or relationship issues or maybe I got a problem with my landlord. All these community knowledge-based things that they were tied to that we are not tied to as well. We are professional accountants, we’re going to restructure your debts, we’re going to solve your financial problems. But there’s always an underlying issue in your life that would be nice if somebody helped with you that too. Doug Hoyes: And that’s the crux of the problem. Doug Hoyes: Ted, thanks very much. I know some of you are watching this and thinking that Ted and I don’t like credit counsellors. You’re thinking that we want you to come to us, not to them, so we’re saying bad things about them. No. We’ve worked very closely with many agencies for more than 20 years and I would love it if they could find a way to fund all of the good work they do without having to resort to having the big banks as their main source of funding. On this podcast we talk about the dangers of credit cards and big car loans and mortgages. Those are products offered by the big banks. Would I be willing to say bad things about credit cards if my main source of income was the big banks and credit card companies? Probably not. In my book Straight Talk on Your Money I made a lot of points that the banks don’t want you to hear. That’s how you know I’m not on the payroll of the big banks. So, what’s the solution? How can we support not-for-profit credit counsellors so they can give unbiased advice to Canadians who need help with money management and don’t want a sales pitch from the banks? I don’t know the perfect answer, but how about considering changing the model entirely. Let’s have licensed insolvency trustees who are federally monitored and regulated and who don’t work for the creditors do debt relief programs. Let’s have not-for-profit credit counsellors do what they are good at, education. So, how can we fund it? Perhaps a coalition of members of the financial services industry could find a way to provide long-term sustainable funding. We could even funnel money from licensed insolvency trustees to credit counsellors, either by allowing us to send credit counsellors work to them again, as Ted mentioned, or perhaps through a supporting funding model. LITs pay a fee to the Office of the Superintendent of Bankruptcy for every consumer proposal and bankruptcy we file. This year there will over 120,000 filings in Canada. What if the fee we pay was increased by $10 a file and that money was distributed to not-for-profit credit counsellors registered as charities whose sole purpose was to educate and help the public. That’s over a million dollars of funding. And what if the banks agreed to kick in some money? They make literally billions of dollars in profit every month. A few million a year shouldn’t be a big deal and it shouldn’t only be done under the hidden agenda of having the credit counsellors act as debt collectors for them. And if they were registered as charities anyone who wanted to improve the financial literacy of Canadians could make a donation and get a tax receipt just like they can do with any other charity. Will this be a better model for consumers dealing with debt issues? I don’t know, but it’s time to start the discussion and come up with some answers. Hopefully today’s show is the start of that process. That’s our show for today. I’ve got links to everything we talked about today, you know, legislation, Canada Revenue Agency and a full transcript of today’s show notes over at hoyes.com. That’s HOYES.com. Thanks for listening. Until next week, I’m Doug Hoyes. That was Debt Free in 30.